It’s been a theme park kind of year for our family. We kicked it off last November in Disneyland for the World of Colour premier, and followed that up with a May trip to San Diego that included a visit to Sea World (more rides and shows than actual marine exhibits). We ended our amusement park tour this week with a quick over-the-border jaunt from BC into Idaho to experience Silverwood, much ballyhooed as the “Pacific Northwest’s largest theme park.” In between these American amusement juggernauts we hit Calgary’s humble Calaway Park in July. 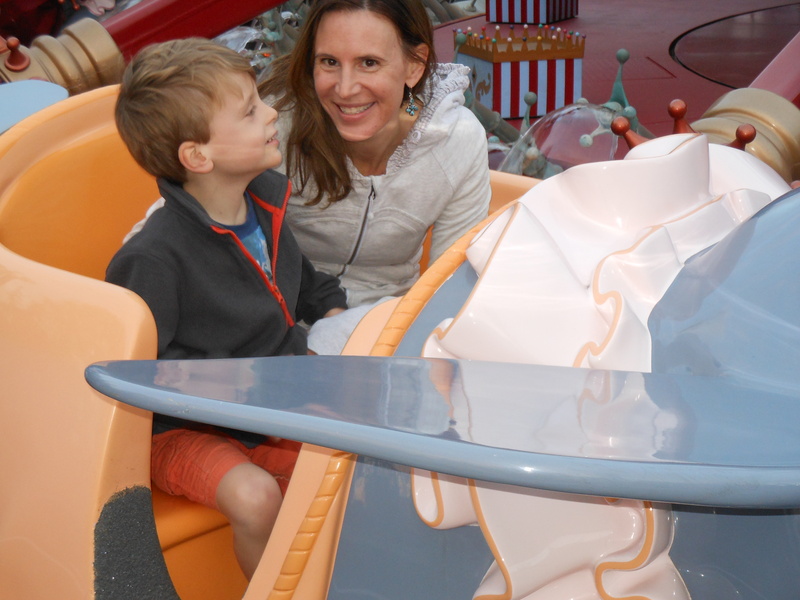 Flying rides like Dumbo at Disneyland are right up Bennett’s alley. 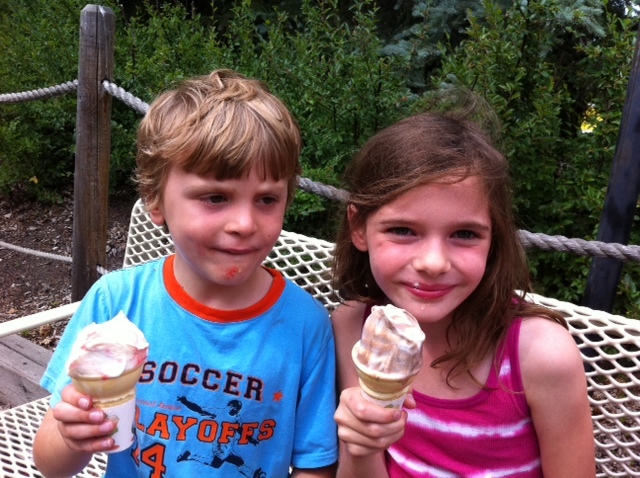 Kids love theme parks on principal. It seems they’re hardwired to want to climb aboard colourful rides and spin around in circles until they get sick, or rocket down hills that leave their stomachs at the summit. Avery and Bennett fall into this category for the most part. Avery, who is the ultimate daredevil, has never ridden a roller coaster she didn’t like, including Silverwood’s Aftershock. Bennett, however, is scared of any ride that goes too fast (roller coasters) or too high (Ferris wheels). 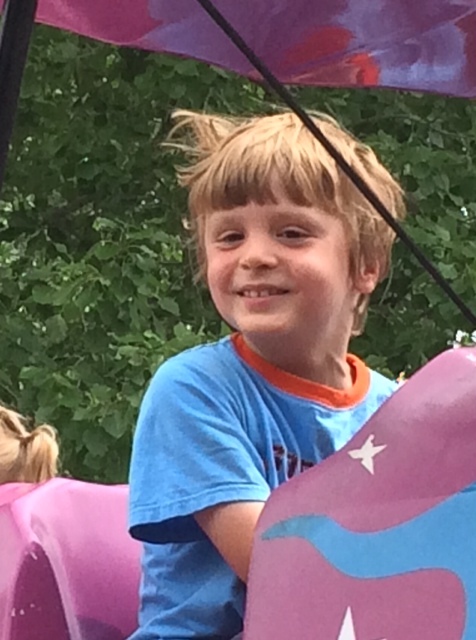 Part of it may be his nature (he’s shy and quiet); part of it may be his autism (he has some irrational fears and doesn’t like crowds or loud noises or waiting in interminable lines all that much — and that’s basically the environment at amusement parks). Whatever the reason, he can get pretty overwhelmed at these places and want to stick to the kiddie zone. 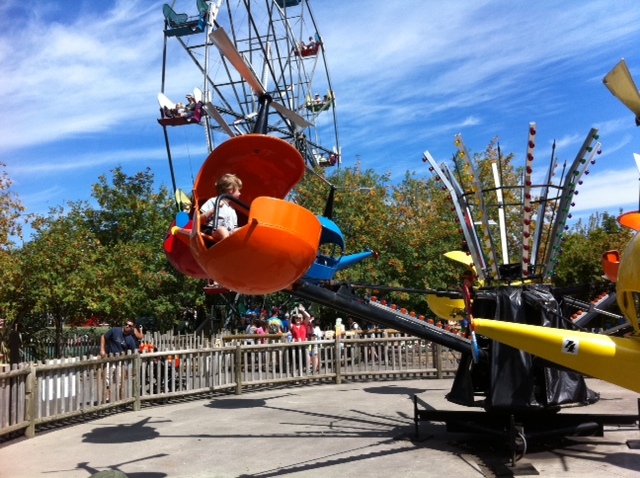 On the airplane ride at the Calaway Park kiddie zone. On the helicopter ride at the Silverwood kiddie zone. Silverwood would surely be different, we thought. It’s in Idaho, after all — and, like, who travels to Idaho? (Avery kept calling it Ohio, but whatever.) Plus, we have many friends that have been there and rave about it. Not only does Silverwood have four roller coasters, it has an outdoor water park with crazy slides. So, Silverwood. But here’s the thing. It was CRAZY BUSY. Seemingly everyone in the Pacific Northwest, including the entire population of Spokane, Wash., along with a bunch of local Idahoans, and a smattering of Oregonians, BC-ers and pedal-to-the-metal Albertans (every time we saw a car pulled over getting a speeding ticket it was someone from Alberta!) decided to visit Silverwood on the last Monday of August. The lines were almost an hour long — longer than Disneyland even. We rode about seven rides in seven hours, compared with riding the same number at Calaway Park in 90 minutes. Well, you might argue, Silverwood’s rides are probably a lot better than those at Calaway Park. With the exception of the roller coasters, I’d have to say they aren’t. Silverwood’s log ride is lame. After that, there are about eight more rides. So we were a family divided — Blake and Avery off to the adrenalin-junkie rides and slides, while Bennett and I whooped it up on the carousel and explored every small water slide in Polliwog Park. Bennett stays focused as our log meanders slowly through a chute. 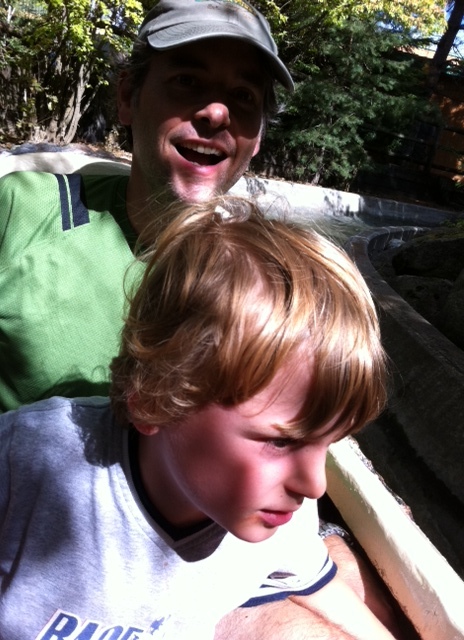 Moving on to good family rides, we were excited to see the same Bumper Boats that they have at Calaway Park. It’s a family favourite so we got in line. Perhaps it’s a holdover from the safety-first mentality, or maybe it’s a result of the United States’ litigiousness, but part of the reason the Silverwood lines moved like molasses is because of the workers’ fastidious attention to safety and procedure. For example, they wouldn’t let us board or disembark the bumper boat unless they were holding it for stabilization — even after it was double-clipped to the dock. They also made kids wear life jackets in case they fell into the three-foot-deep pond. They also wasted time by scolding the guests waiting in line: “Don’t stand on the railings! Stay behind the yellow line!” This slowed things up considerably. For me, the best part of the ride was introducing the “close-up” spray to America. When I got near one middle-aged man’s boat I put my finger over the squirter, to better direct the stream of water into his face (much to Bennett’s glee). “Hey, that’s cheating!” he shouted. “It’s a new technique!” I countered. Blame it on Canada! Bwa-ha-ha-ha-ha-ha-ha! Then there’s the matter of the ice cream. This is one reason Canadians love America: the food (and beer) is cheap and plentiful. But seriously? A gallon-sized giant scoop for $4.25? Is that really necessary? We ended up throwing half the ice cream away, much to the dismay of morbidly obese onlookers. 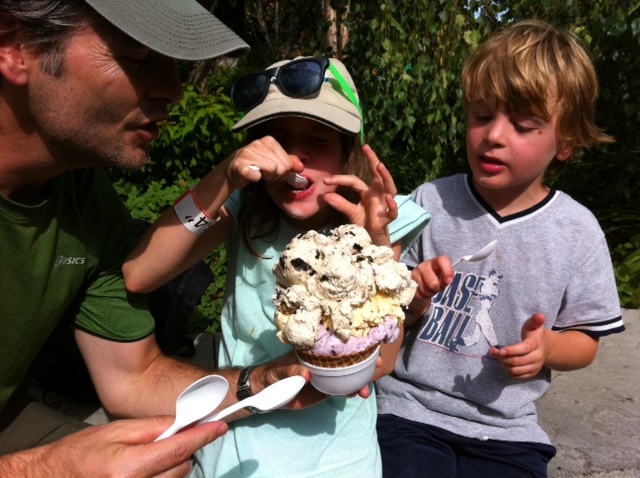 Blake, Avery and Bennett attempt to eat an ice cream “scoop” that could solve the world’s hunger problem. Now that’s a proper kid-sized ice cream cone. This entry was posted in Travel and tagged Calaway Park, Calaway Park with kids, Disneyland vs Silverwood, Silverwood theme park for families, what's the best theme park for kids?. Bookmark the permalink.